When we deliver our training course it is vital to use some form of assessment or evaluation as to the effectiveness of our training. We need to be acutely aware of how well our learners are picking up the core concepts of our training, and on a higher level how well they can then apply these concepts. Kirkpatrick’s four level of training evaluation was designed for just this situation, it allows you to understand in an objective fashion how effective and impactful your training has been. This then allows you to self reflect and identify areas of your course that can be improved or developed. So lets have a look at the four levels and what they mean. 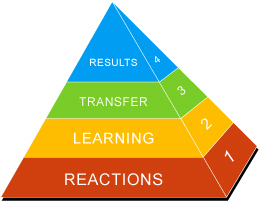 At this level you are seeking to measure how your learners reacted to the training as it was placed in front of them. A great deal of this comes down to feel, more specifically how did the learner feel about various aspects of the training and process. This level seeks to evaluate the learning that has taken place, we are essentially measuring an increase in knowledge or skill. This essentially comes down to your assessment plan for the course… put even more simply how are you going to judge (and in some cases prove) that the learning objectives have been met. This is a higher level of learning, where as many objectives are about recall, of a fact or a method of doing a certain task. This is all about the application of knowledge, has your training truly made a change in the learner, has it been taken on as part of their approach. This application goes much deeper than sheer recall. Now for behaviour change to take place we need to ensure that we cultivate an environment where change is possible, this is an area that is not often considered by course designers. The environment is so important when it comes to the ability of learners to go through the behaviour change process…. this is probably a topic for a post of its own. It is important to note that there are such a wide range of reasons as to why learning has not been applied, so just because this level of evaluation is not positive does not equate to a lack of a learning process. What has been the overall result of your training programme in a wider context. Does the training provided meet wider organisational or industry needs? Evaluation is such an important process within education, we have to bear in mind that just ‘because this is how it has always been done’ or ‘it would be alot of work to change that’… in my opinion anyway is not a reason not to give our learners the very best we can in terms of education. They deserve it and as educators we can always and should always be looking for ways to push our own and in turn our learners boundaries. So here is a question for you do you evaluate your training on all levels? Or does it tend to be assessment based (level 2) and feedback based (level 1)? How could you identify behaviour and results based changes? What can you improve today about your courses? Share with us what you have found in terms of evaluation, just use the comments box below.